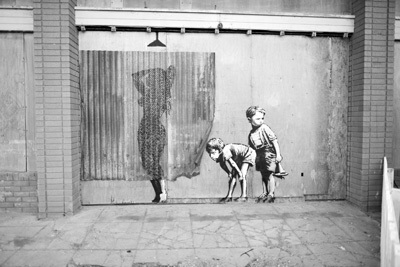 The email read "HIGHLY CONFIDENTIAL: THE ARTIST BANKSY WANTS TO GET A HOLD OF YOU. IS THIS A DIRECT EMAIL CONTACT FOR DIETRICH WEGNER?" Like most savvy technophiles of his age, Dietrich Wegner deleted the email believing it was spam. Then came another one. Deleted. And another one. Deleted. He received three to four emails each week for three weeks. "I'm an artist and I have Banksy posts on my Pinterest account, so it wouldn't be hard for spam software to know that I like Banksy," thought Wegner, an associate professor in the art department at Edinboro University. Finally, he embraced the barrage of email and responded. A few emails later he was talking to Banksy, the elusive artist whose work has been described as radical and revolutionary, and regarded as cultural criticism that's defining a period of illicit public art. 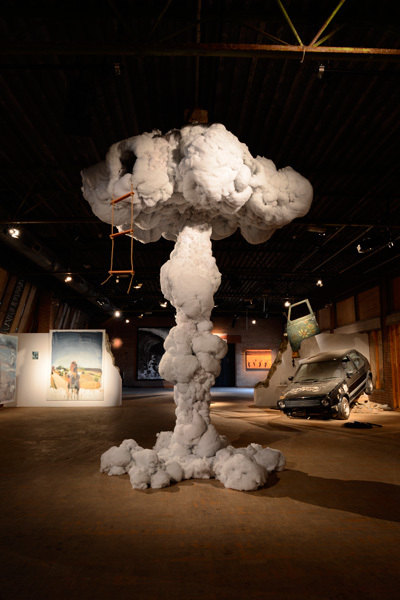 Banksy had seen Wegner's work at the Robert Berman Gallery in Santa Monica, Calif. One of Wegner's pieces from that show, a mushroom cloud playhouse, had been featured in Los Angeles Weekly. 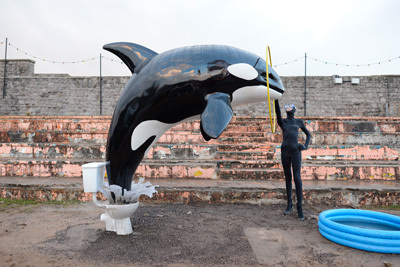 It caught Banksy's attention and he wanted to include it in his next project, an immersive art experience called Dismaland, set in Weston-super-Mare, a seaside town that suffered an economic downturn beginning in the 1970 Dismaland is branded as a "bemusement park," a "family theme park unsuitable for children." 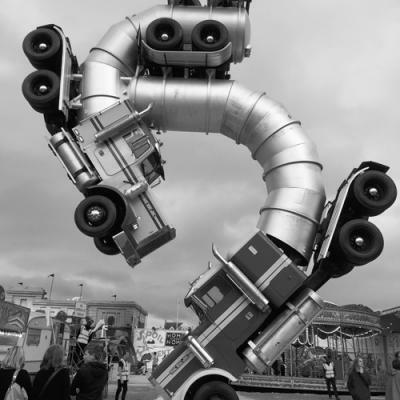 It features massive sculptures in the form of amusement park rides, circus tents, and giant fountains with water shooting from armored police assault vehicles.s as a result of inexpensive airfare that took Brits to other destinations across continental Europe. One of the main attractions at Dismaland is a fairy castle, "Cinderella's Castle," in which visitors are struck by strobe lights that emulate the flashbulbs of paparazzi. As your eyes adjust, you realize you're among the paparazzi and the subject of their attention – and yours – is the fatal crash of Cinderella's coach, evocative of the death of Princess Diana. Banksy's been planning the show for five years. The site became available six months ago, and Banksy started recruiting talent like Wegner. Banksy has 10 original works at Dismaland and 58 other artists contributed work, some original to Dismaland, some, like Wegner's, from their portfolio of previous shows. Wegner's shown his work in galleries around the world, from New York, Chicago, and L.A. to Toronto, the Netherlands, and Vienna, Austria, among others. Wegner says this kind of show, one that's surrounded by such hype, is incredibly rare. In 2013 his work appeared at the Leopold Museum in Vienna alongside Monet and Van Gogh, to give you a sense of the company kept by Wegner and his work. "These people are the benchmarks of art history and I was so psyched to be a part of that – it had these huge people, perhaps larger figures than Banksy will ever be – but it got zero hype," he recalls. "So it was weird to go from that – this pristine environment with no hype – to this show on a filthy beachfront site, with sand blowing through the gallery and lots of attention." The two pieces Wegner contributed to Dismaland were works he's displayed before. Banksy chose the aforementioned mushroom cloud playhouse – a 20-feet-by-9-feet-by-9-feet mushroom cloud complete with treehouse rope ladder that leads through an opening into the billowing cloudtop – and an infant in the fetal position tattooed with corporate brands including Lego, Best Buy, and Ohio State University, where Wegner earned his Master of Fine Arts in 2003. But Banksy's perspective gave Wegner's work new life. The mushroom cloud was configured differently than it had been before and the baby was placed in new context. "I've always been experimental with my work, so I like that it was reimagined," says Wegner. 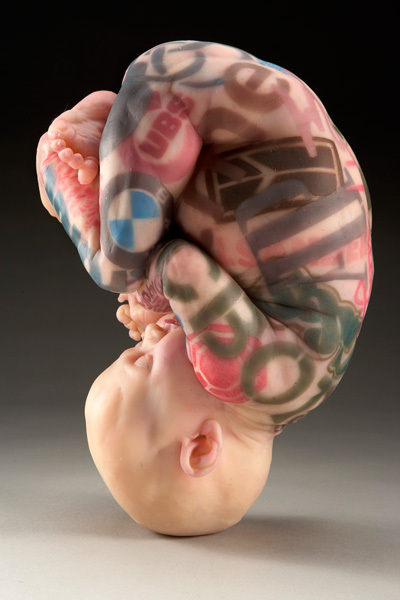 "Banksy hung the baby upside down in a vending machine where it spins in a circle, and as it spins the light hits different parts of the baby as it moves, so every second you have a new experience with the piece." Wegner's contributions are heavily featured in Dismaland promotions, which might seem a bit ill-suited given the anti-corporate, anti-promotional character of the show. But Wegner had a different view of Dismaland when he visited the site this summer. "We went to Weston-super-Mare directly from Disneyland. What was ironic," he says, "is that almost everybody is having a huge amount of fun at Dismaland and so few people were having fun at Disneyland because of the lines, the crowds, and the fact that it doesn't really stand for anything except 'forget your life and let's spend money.' Banksy's critique of Disneyland is a metaphor for our own little fairy tale."